Is U.S. employment law undergoing a revolution? In this work, Donald Brodie examines the basic themes of current employment law and identifies what is changing and what is not changing, using commonplace examples. Basing his conclusions on extensive studies of state and federal court decisions and arbitration awards, Brodie focuses on the individual contract of employment, the elements that have remained constant, including judicial restraint, employer rights, and just cause, and the statutory elements that foster the most change. Brodie begins his study by identifying some of the elements that must be considered in determining whether an employment relationship exists, and follows this with a chapter discussing possible dispute resolution forums, such as courts, arbitration, due process, in-house grievance mechanisms, and government agencies. 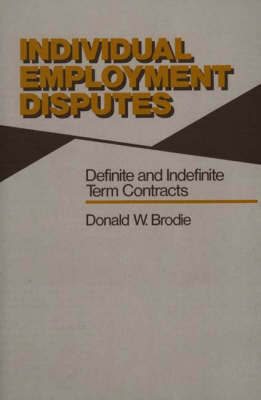 Separate chapters are devoted to the various facets of the doctrine of employer rights; the process of creating, modifying, and ending the employment relationship and contract; and specific clauses in contracts that are subject to frequent disputes, particularly terms of duration, releases and waivers, and noncompetition clauses. Other topics addressed at length include the just cause concept and the process of evaluation, and the interplay between statutes and employment contracts. A final chapter presents Brodie's conclusions, grouped into the categories of employer, employee, and public interest. Professionals involved in employment relations, as well as public and academic libraries, will find this book to be an important resource. It will also be a valuable reference work for students in business and legal studies.